Yes, and your credit card charges will appear in US dollars. Are these the same products my Vet sells, are these genuine? 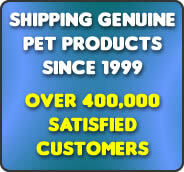 Yes, all our products are from the same manufacturers that provide products to your local vet. Shipping times vary between 6-12 business days. Am I protected from online frauds? We never store your credit card information on our server. PayPal charges non-US merchants 6% transaction fees per order. We'd rather pass that saving to our customers instead.